How do you go about turning one of the world’s most famous novels into a ballet? That’s the challenge Martha Lee Bolt and Tobias Butley were faced with when they scored the lead roles in Northern Ballet’s upcoming production of 1984. Exposed chats to them bringing the world’s most famous dystopia to the stage. 1984 tells the tale of Winston and Julia, two citizens of a futuristic surveillance state where not only acts but thoughts are policed. Flaunting the demands of the state, they fall in love, risking everything. They may be the ones on the posters, but Martha and Tobias are only two of six dancers who’ll be taking up the mantle of Winston and Julia over the course of the tour. The team tried hard not to be influenced by any other adaptations. 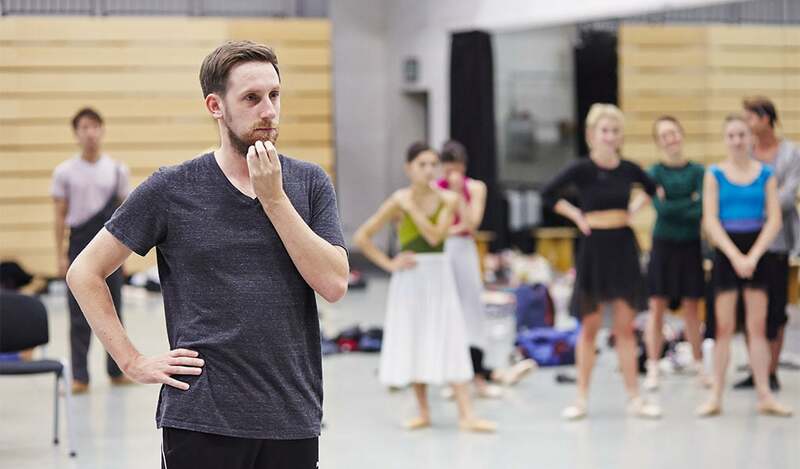 Choreographer Johnathan Watkins deliberately didn’t watch the famous film starring John Hurt, and missed the recent Headlong theatre production. With nothing else to go off, his copy of the novel is bursting with post-its. Neither Martha nor Tobias had read the book before embarking on this production. Having grown up watching Big Brother and Room 101 but without knowing where they’d come from, Tobias instantly saw the novel’s potential as a ballet. It’s got that “essential romance” that characterises so many famous ballets. Despite their wish not to be influenced by other adaptations, the team had to balance that with their wish to incorporate contemporary influences, while keeping the production timeless. Watkins recommended that the whole team watch the Edward Snowden documentary Citizenfour, to prepare. So who are Winston and Julia deep down, at their core? Julia doesn’t want to be the centre of attention, according to Martha, “she’s happy to be on the edge of the party.” Both of them agree that Julia’s probably the smarter one. While Winston goes all-out in his rebellion with the slightest provocation, Julia remains apprehensive, wondering about the consequences at every turn. Does that mean Winston is braver? There’s a fine line between and bravery and stupidity, Martha notes. Both of them remain somewhat sneaky and suspecting in their movements for the entire ballet. Midway though the story, having seemingly escaped the surveillance of Big Brother, the two embrace for the first time. It’s a triumphal moment, but as they take each other’s hands and peer furtively back at the audience. It’s a reminder that in a society like this one, can people truly love each other? Were Winston and Julia simply rebelling against their government in the only way they knew how? It’s a question that readers of the novel have wrangled with for decades. And what would they put into Room 101? Spiders, Martha says. No surprise there. Slightly more appropriately, Tobias opts for the pain of dancing. “Wouldn’t it be lovely if we could just dance without any of the pain?” he opines. 1984 hits the Lyceum between the 20th and 24th October. Tickets available here.